The 2008 Florida Commuter Choice Summit, sponsored by the Florida Department of Transportation (FDOT), and co-hosted by the St. Petersburg Downtown Partnership and University of South Florida’s Center for Urban Transportation Research (CUTR), was held on December 4 and 5, 2008 at the Hampton Inn & Suites in St. Petersburg, FL. A Florida Commuter Choice Certificate training workshop, Public Presentations the Media Love, was held on December 3. The summit is an annual event that includes interactive training and lively discussion groups, presentations on Transportation Demand Management (TDM) topics, announcement of the Florida Travel Choices Award winners, and recognition of Florida’s newest ROAD SCHOLARS (Graduates of the Florida Commuter Choice Certificate program). Innovative Program Award: Award given to a Florida public transportation system, commuter assistance program, transportation management organization or other Florida entity that has designed and implemented specific public transportation-related programs that demonstrate innovative concepts or effective problem-solving techniques. The program should be of proven value and adaptable for use by others. Programs must have been implemented within the past two years and submissions should quantify results. Award Recipient:Jan Parham, FDOT Commuter Services of Southwest Florida. Serving travelers who live and work in the 12-county region of Southwest Florida, the program is innovative in its concept, design, and implementation. Marketing Excellence Award: Award given to recognize excellence in Florida public transportation-related marketing including, but not limited to the following: advertising campaigns, electronic media, print media and special events. Marketing program must have been implemented within the past two years. Award Recipient: HART Commuter Express Neighborhood Targeted Adveritsing Presented to Jill Cappadoro. Advertising route-specific information in residential newsletters provided a neighborhood-focused forum to customize a message. 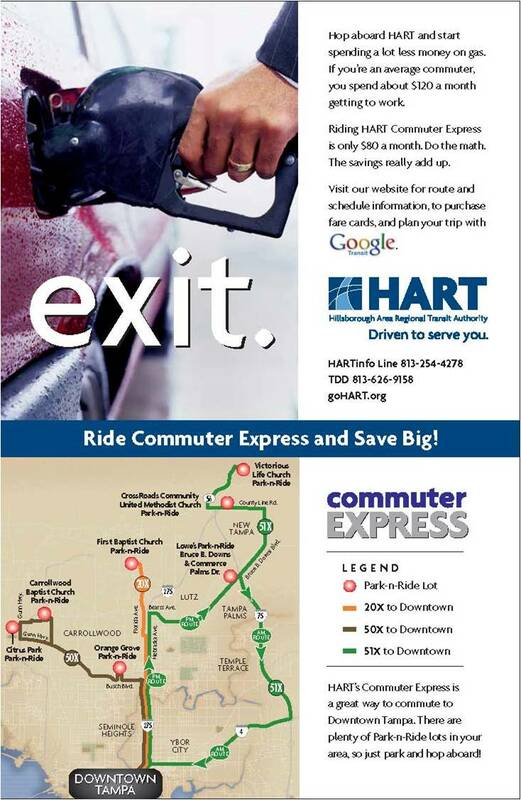 In this case, HART promoted its Commuter Express routes and used a call to action that included a free 1-Day Unlimited Ride fare card. Leadership: Award given to honor a Florida individual who has made outstanding contributions to the public transportation industry. This award may be conferred upon a public transportation policy maker or private citizen who has made outstanding contributions at the local or state level to public transportation. Describe the nominee’s exceptional achievement or contributions to the advancement of the public transportation industry.